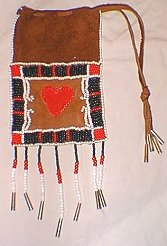 The beaded bags below are copied from photos of originals that were published in American Indian Art Magazine, Summer 1997. They came from the collection in Courtesy Stadtisches Museum and Braunschweigisches Landesmuseum, both in Brunswick, Germany and were collected between 1770-1780. The originals were done mostly in quill work and the designs were reproduced here in #8 beads. The meanings of the designs has long since been forgotten. 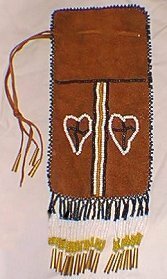 The bags are made of deer skin leather and the dark drown can be documented because the woodland tribes were known to dye their leather with black walnut hulls. This produced the dark brown color. 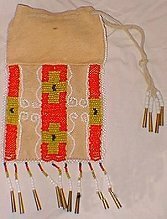 The beige bag is made with a commercial brain tan deer skin and left in it`s smokey golden brown color. The fringes are made with the same #8 beads and brass cones. All measurements are not including the fringe. These bags are made to order. Custom work available. Give 2-3 weeks for delivery. Include $4.50 S&H per $100.00 (insurance and Priority Mail) for these items.